Track List:BLUE ORPHEUS (DIFFERENT MIX/VERSION). JOHNEE JINGO. PRETENDING TO CARE. HODJA. LOST HORIZON. SOMETHING TO FALL BACK ON. MIRACLE IN THE BAZAAR. LOCKJAW'S COMING. HONEST WORK. MIGHTY LOVE. Track List:CD ONE: LOVE OF THE COMMON MAN. CLICHE'. IT WOULDNT HAVE MADE ANY DIFFERENCE. TOO FAR GONE. CAN WE STILL BE FRIENDS. TEPTAE VIDEO. SONG OF THE VIKING. HONEST WORK. JOHNEE JINGO. TINY DEMONS. LORD CHANCELLOR'S NIGHTMARE SONG. BAG LADY. CD TWO: DRUNKEN BLUE ROOSTER. BANG THE DRUM ALL DAY. TEPTAE VIDEO. IM SO PROUD/OOH BABY BABY/LA LA MEANS I LOVE YOU. I SAW THE LIGHT. ONE WORLD. TYE WHEEL. DREAM GOES ON FOREVER. TODD (SOLO):CLICHÉ’.IT WOULDN'T HAVE MADE ANY DIFFERENCE.CAN WE STILL BE FRIENDS.LYSISTRATA. Track List:PLAY THIS GAME. STYLE. PRINCESS OF THE UNIVERSE. SET ME FREE. HAMMER IN MY HEART. SWING TO THE RIGHT. ZEN MACHINE. MATED. MYSTIFIED. ROAD TO UTOPIA/CARAVAN/MORE LIGHT. Track List:PLAY THIS GAME.STYLE.PRINCESS OF THE UNIVERSE.SET ME FREE.HAMMER IN MY HEART.SWING TO THE RIGHT.ZEN MACHINE.MATED.MYSTIFIED.ROAD TO UTOPIA.CARAVAN. Track List:PLAY THIS GAME. PRINCESS OF THE UNIVERSE. STYLE. HAMMER IN MY HEART. SWING TO THE RIGHT. ZEN MACHINE. MATED. MYSTIFIED. THE ROAD TO UTOPIA. Track List:PLAY THIS GAME (FADES IN). STYLE. PRINCESS OF THE UNIVERSE. SET ME FREE. HAMMER IN MY HEART. TODD TALK. SWING TO THE RIGHT. ZEN MACHINE. MATED. MYSTIFIED. ROAD TO UTOPIA. CARAVAN.DRUM SOLO.CARAVAN (CONT'D). MORE LIGHT.LOVE IS THE ANSWER. Track List:HAMMER IN MY HEART. SWING TO THE RIGHT. ZEN MACHINE. MATED. MYSTIFIED.THE ROAD TO UTOPIA/CARAVAN/MORE LIGHT. JUST ONE VICTORY. Track List:AUDIENCE & TUNING.PLAY THIS GAME. STYLE. PRINCESS OF THE UNIVERSE. SET ME FREE. HAMMER IN MY HEART. SWING TO THE RIGHT. ZEN MACHINE. MATED. MYSTIFIED. ROAD TO UTOPIA. CARAVAN. MORE LIGHT. LOVE IS THE ANSWER. JUST ONE VICTORY. WITH THE TUBES: BABA O'RIELLY/THE KIDS ARE ALRIGHT. Track List:(CUTS IN)PLAY THIS GAME. STYLE. PRINCESS OF THE UNIVERSE. LOVE IS THE ANSWER. HAMMER IN MY HEART. SWING TO THE RIGHT. ZEN MACHINE. THE ROAD TO UTOPIA. MATED. (CUTS IN) MORE LIGHT. Track List:PLAY THIS GAME. STYLE. PRINCESS OF THE UNIVERSE. SET ME FREE. HAMMER IN MY HEART. SWING TO THE RIGHT. ZEN MACHINE. MATED. MYSTIFIED. ROAD TO UTOPIA. CARAVAN. MORE LIGHT. LOVE IS THE ANSWER. Note:This is a decent but not great audience recording that becomes quite comfortable listening. Not the whole show of course but, Jamie Slatterly did wonders to this tape. If you were there...or if you like the era, this is a pretty good, but not superb, audience recording and a fab clean up job by Jamie. Track List:(CUTS IN) PLAY THIS GAME.STYLE. PRINCESS OF THE UNIVERSE.SET ME FREE.HAMMER IN MY HEART.SWING TO THE RIGHT.ZEN MACHINE.MATED.MYSTIFIED.THE ROAD TO UTOPIA/CARAVAN/MORE LIGHT.LOVE IS THE ANSWER. Track List: CD ONE: BORN TO SYNTHESIZE. LOVE OF THE COMMON MAN. CLICHE'. TOO FAR GONE. SONG OF THE VIKING. JOHNEE JINGO. BLUE ORPHEUS. PRETENDING TO CARE. HODJA. LOST HORIZON/MARVIN GAYE MEDLEY. TINY DEMONS. LORD CHANCELLOR'S NIGHTMARE SONG. HONEST WORK. CD TWO: IT WOULDNT HAVE MADE ANY DIFFERENCE. CAN WE STILL BE FRIENDS. BANG THE DRUM ALL DAY. IM SO PROUD/OOH BABY BABY/LA LA MEANS I LOVE YOU/I SAW THE LIGHT. MIGHTY LOVE. SOMETHING TO FALL BACK ON. REAL MAN. LOVE IS THE ANSWER. Track List:BORN TO SYNTHESIZE. LOVE OF THE COMMON MAN.CLICHE. TOO FAR GONE. SONG OF THE VIKING. JOHNEE JINGO. BLUE ORPHEUS. PRETENDING TO CARE. HODJA [FALSE START]. HODJA. LOST HORIZON / MARVIN GAYE MEDLEY/ I WANT YOU. TINY DEMONS. LORD CHANCELLOR'S NIGHTMARE SONG. HONEST WORK. IT WOULDN'T HAVE MADE ANY DIFFERENCE. CAN WE STILL BE FRIENDS.BANG ON THE DRUM. MEDLEY:I'M SO PROUD/ OOH BABY BABY/ LA LA MEANS I LOVE YOU. I SAW THE LIGHT. MIGHTY LOVE. SOMETHING TO FALL BACK ON. REAL MAN. LOVE IS THE ANSWER. Track List:INTRO. BORN TO SYNTHESIZE. JOHNEE JINGO. HODJA. PRETENDING TO CARE. LOST HORIZON/MARVIN GAYE MEDLEY. TINY DEMONS. REAL MAN. HONEST WORK. CAN WE STILL BE FRIENDS?. MIGHTY LOVE. SOMETHING TO FALL BACK ON. Track List:CD ONE: BORN TO SYNTHESIZE. LOVE OF THE COMMON MAN. CLICHE'. TOO FAR GONE. SONG OF THE VIKING. JOHNEE JINGO. BLUE ORPHEUS. PRETENDING TO CARE. HODJA. LOST HORIZON/WHATS GOING ON/MERCY MERCY ME/ I WANT YOU. TINY DEMONS (CUTS) CD TWO: LORD CHANCELLOR'S NIGHTMARE SONG. HONEST WORK. IT WOULDNT HAVE MADE ANY DIFFERENCE. CAN WE STILL BE FRIENDS. BANG ON THE DRUM ALL DAY. IM SO PROUD/OOH BABY BABY/LA LA MEANS I LOVE YOU/I SAW THE LIGHT. MIGHTY LOVE. SOMETHING TO FALL BACK ON. REAL MAN. Track List:DISC1: BORN TO SYNTHESIZE.LOVE OF THE COMMON MAN.CLICHE/TOO FAR GONE.SONGS OF THE VIKING.JOHNEE JINGO.BLUE ORPHEUS.PRETENDING TO CARE.HODJA.LOST HORIZON/WHAT'S GOING ON/MERCY ME/I WANT YOU. DISC2: TINY DEMONS.LOAD CANCELLOR'S NIGHTMARE.HONEST WORK.IT WOULDN'T HAVE MADE ANY DIFFERENCE.CAN WE STILL BE FRIENDS.BANG ON THE DRUM ALL DAY.I'M SO PROUD/OOH BABY BABY/LA LA MEANS I LOVE YOU/I SAW THE LIGHT.MIGHTY LOVE.SOMETHING TO FALL BACK ON.REAL MAN.LOVE IS THE ANSWER. Note:This infamous ‘bootlegged to death’ Dallas Show is of course the best of our A Capella shows. Dozens of Bootleg Blogspots have it MP3’d, unfortunately too. 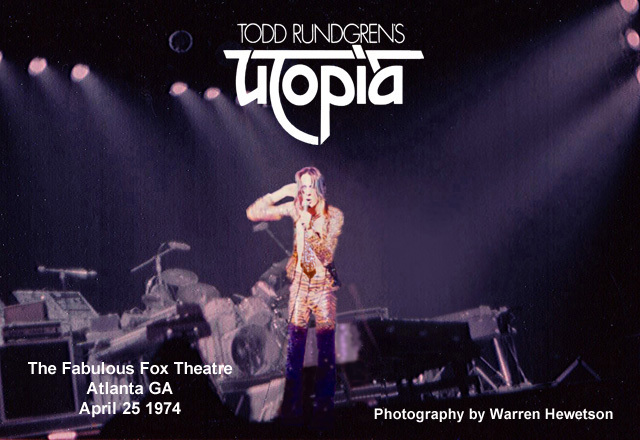 However, it is officially available on The Todd Rundgren Archive Series Archive Vol.7 A Cappella Tour CRCL-7713/14. You can probably buy/get it through Scott at TRBAZAAR. Suport the artist please! Track List:BORN TO SYNTHESIZE. LOVE OF THE COMMON MAN. CLICHE'. TOO FAR GONE. SONG OF THE VIKING. JOHNEE JINGO. BLUE ORPHEUS. PRETENDING TO CARE. LOST HORIZON/MARVIN GAYE MEDLEY. TINY DEMONS. HONEST WORK. IT WOULDN'T HAVE MADE ANY DIFFERENCE. CAN WE STILL BE FRIENDS?. I SAW THE LIGHT (CUTS IN). MIGHTY LOVE. SOMETHING TO FALL BACK ON. REAL MAN. LOVE IS THE ANSWER. Track List:PLAY THIS GAME. TINY DEMONS. CLICHE. MARVIN GAYE MEDLEY. IT WOULDN'T HAVE MADE ANY DIFFERENCE. DRUNKEN BLUE ROOSTER.BLUE ORPHEUS. Track List:DISC ONE: BORN TO SYNTHESIZE. LOVE OF THE COMMON MAN. CLICHE. TOO FAR GONE. SONG OF THE VIKING. JOHNEE JINGO. BLUE ORPHEUS. PRETENDING TO CARE. HODJA. LOST HORIZON/MARVIN GAYE MEDLEY. DISC TWO: TINY DEMONS. LORD CHANCELLOR'S NIGHTMARESONG. HONEST WORK. IT WOULDN'T HAVE MADE ANY DIFFERENCE. CAN WE STILL BE FRIENDS. BANG THE DRUM ALL DAY. I'M SO PROUD MEDLEY/I SAW THE LIGHT. MIGHTY LOVE. SOMETHING TO FALL BACK ON. REAL MAN. LOVE IS THE ANSWER.